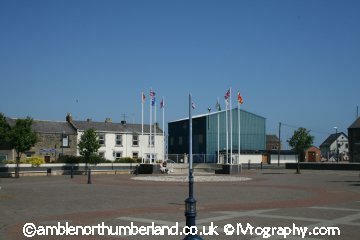 TOWN SQUARE Amble Town Square was completed in May 2001 and officially opened on 27 May 2001 by the local MP Alan Beith. It is located on the site of the former Comrades CIU Club which later became ‘Freddies’ (named after the dolphin who used to live in the harbour). In order to create the square permission had to be sought to change the road layout. The original road – an extension of Queen Street, ran straight past the war memorial and then turned left onto Lawson Street. Today, the square provides a focal point for Remembrance Services, Farmers Markets and various exhibitions and town fairs. 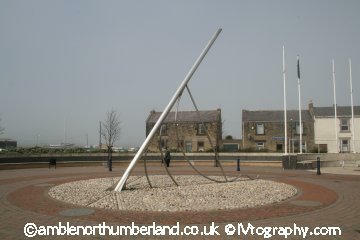 There are a number of features in the square which are unique to Amble The most noticeable feature in the square is the sundial (or Gnoman) which is one of the largest in Europe and is accurate to within 15 seconds – it is set into a bed of local pebbles. There is also an amphitheatre with some seating which has nine, 8 metre masts around it. These masts are used to display banners and flags– usually of other European countries. The square also features a winding ‘historic trail’ in pink stone with a number of embellished carved stones which were developed from original designs by local school children and show scenes from Amble’s history. 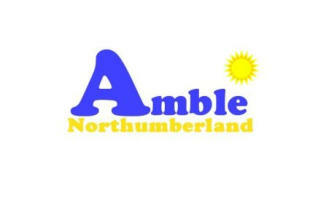 There were originally six trees in the square – five named after Amble schools and the sixth called the ‘Town Tree’. Finally, surrounding the square there is a memorial garden in remembrance of Muriel Usher, a pharmacist and a notable local character and two benches which are in memory of Dr and Mrs Robertson and Jesse Taylor.